Located on a magnificent stretch of white-sanded beach at Worthing on the popular South Coast of the island, Blue Orchids is a cluster of 3 buildings set amidst lush tropical gardens and casuarina trees overlooking the beach and ocean. In 2003 this property has been just completed an extensive renovation, refurbishment and landscaping programme and extended by another 15 rooms. 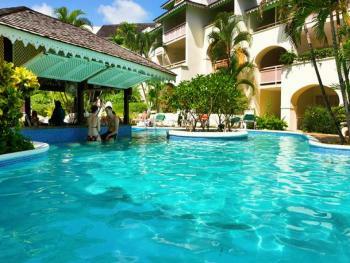 Blue Orchids is a premier Barbados hotel and Caribbean resort. It is an ideal holiday location for a Caribbean Barbados Vacation. Enjoy a vacation at Blue Orchids Beach Hotel and create memories that last a lifetime! Great for holidaymakers including couples and families. Golf- Play to your hearts content on Barbados' only public Champion Golf Course. Blue Orchids is an Official Partner of the Barbados Golf Club and provides our guests with special golf packages for this golf course. The par 72 course is the work of Ron Kirby, one of the world’s most experienced golf course designers. Watersports Facilities Blue Orchids is located on a magnificent stretch of beach and numerous watersports activities are available including kayaking and boogie boarding. Selected rooms have data ports.